I can’t be credited with the invention of this delicious dip; it was a staple at BBQs with my second group of Aussie housemates, and became a staple when I moved to my third house in Perth, but I have since found out it’s actually a condensed version of the American 7 layer dip. Basically, a delicious layering of all those Tex-Mex flavours that looks pretty for approximately 10 seconds before it is attacked with tortilla chips and then looks…kinda gross. I hadn’t made it in forever; I actually bought a sachet of the taco seasoning mix we always used back to the UK with me when I revisited Perth in November 2012, but was (stupidly) waiting for the perfect occasion to break it out. Anyway, my little brother was desperate to ‘cook’ something when I visited last weekend, and with the lovely weather we’ve been having in Cornwall plus his love of Mexican food, I decided it was time for the dip to reappear (although not the sacred packet of taco seasoning, an event worthy of it’s use is still being waited for! By which point it will be out of date, no doubt). 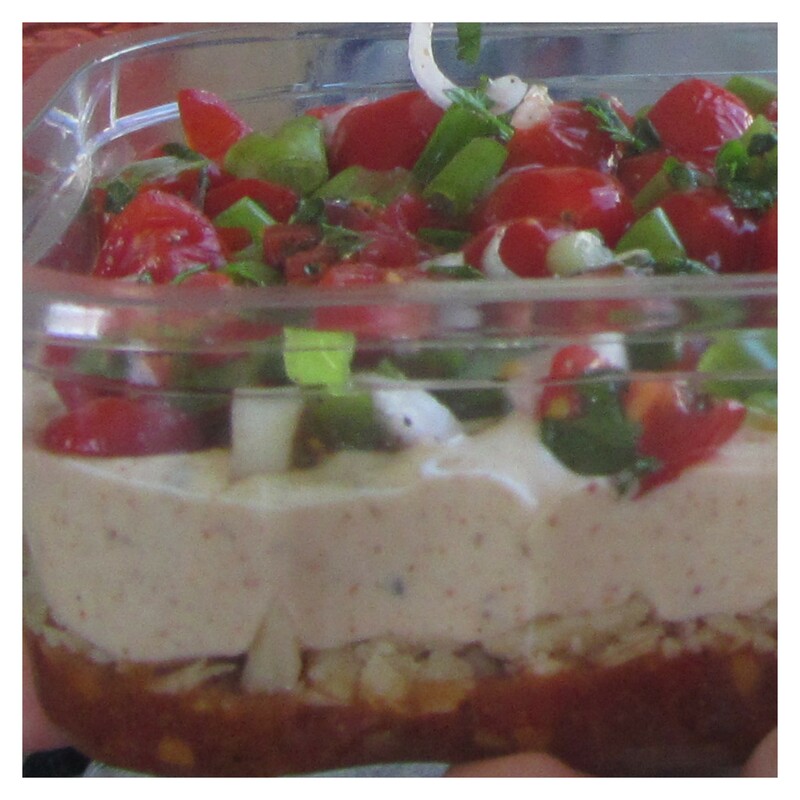 Google leads me to believe, as does the recipe my friend originally showed me, that 7 layer dip and this version is pretty much layers of premade things, but we decided to do more of it from scratch as I had homemade seasoning mixes already, so I’ve included both options. The quantities for each layer will depend on the size of the bowl you’re using. Ours was a rather classy plastic fruit tray as every other bowl had been claimed for something else, so the quantities in the homemade option will fill a roughly 15cm square or round dish. Basically, you want the salsa and sour cream layers to be equal depths, and to have enough cheese and toppings to make a thick-ish covering. 2nd layer: Grated cheddar cheese. 3rd layer: Sour cream combined with taco seasoning. 4th layer: Tomatoes (diced), spring onions (sliced), coriander (optional), lemon juice, salt and pepper. 1st layer: 1 tin chopped tomatoes (drained) combined with 2tbsp homemade salsa seasoning. 3rd layer: 100g light cream cheese + roughly similar volumes of light mayo and natural yoghurt, combined with 1tbsp homemade taco seasoning. To be honest, we made our own version of sour cream because I didn’t realise Lidl doesn’t sell it and going to another supermarket was just too much hassle. Once the taco seasoning was mixed in, you really couldn’t tell any difference, and I think next time I’ll try it using just mayo and natural yoghurt as I always have those in the fridge. Apologies for the dodgily cropped photos: my brother would not appreciate me putting his face all over the internet and I didn’t manage to get any pictures without him before the dip got devoured. I’ve never made a cheeseball before, I’ll have to try it! And I’m intrigued by your BBQ’d pizza, sounds good for summer cooking. I don’t think I would make pizza any other way now. It’s odd, but SO good!